If you would like to visit a few museums while visiting Oslo, you can use Oslo Pass and freely choose to enter into any museum in Oslo. However, if you are a backpacker and does not have sufficient funds, then there are several options free attractions that you can visit in Oslo. 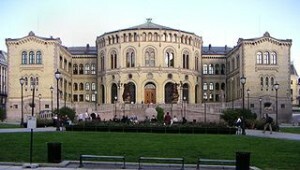 one of popular free attraction is Stortinget or Norwegian Parlieament Building. Stortinget is the supreme legislative institution in Norway, which has 169 members and is elected every four years. Since 5 March 1866, the Norwegian Parliament Building is the place to meet the MPs. Norwegian Parliament Building is located along Karl Johans Gate and adjacent to the famous Grand Café, the second building is impossible to miss if travelers passing through street Karl Johans Gate. The building was designed by Swedish architect Emil Victor Langlet, and built using the yellow brick architectural style combined with French and Italian. The lion statues on display right in front of the building became a symbol of the Norwegian parliament. In the summer there is a free tour guide for a tour of the parliament building, without using a tour guide, visitors can not enter the Norwegian Parliament Building.